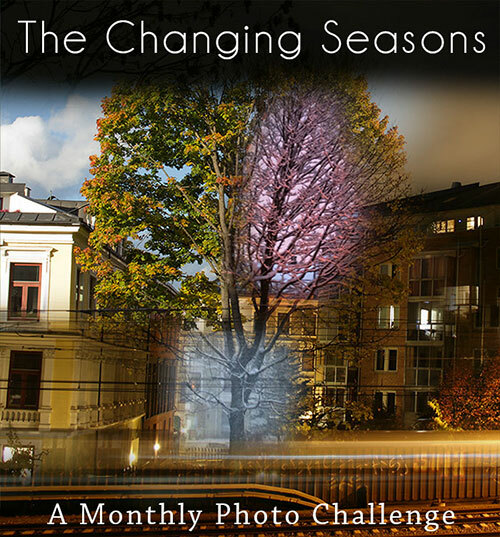 Welcome to this challenge that’s called «The Changing Seasons 2016». As most of you already know, there are two versions to choose from this year; the original (V1) which is purely photographic and the new version (V2) where you can allow yourself to be more artistic and post a painting, a recipe, a digital manipulation, or simply just one photo that you think represents the month. Anyone with a blog can join this challenge and it’ll run throughout 2016. To join the challenge, you simply decide which one of the versions you’ll go for (it doesn’t have to be the same version each month), create a post in your blog and publish it sometime between the 20th and the end of each month. This month, I decided to go for both versions, one of the reasons is that I thought it’s a good way to start this challenge in 2016, another reason is that until the evening of the 19th (that would be the last night before this post went live) I couldn’t come up with any good idea for a composite image. The days before that I felt that I had to shoot some photos like a back-up plan. Since I run this challenge, I can’t really just skip a month – especially not the first month of the year! Because of the cold temperatures and high pressure, the air is really bad: dry, cold and extremely polluted. On some days asthmatics and old people cannot go outside. We’re not supposed to do any sports activities either on the coldest days because of all the pollution from the cars (especially diesel run vehicles). We’re past winter solstice, so the days are getting longer and there’s more light, but it’s still a dark and cold month, meaning that most of us spend a lot of time inside. This can make you feel depressed. Also the lack of sunlight and sometimes vitamin D, can make you even more depressed. The next holiday isn’t until March/April (and that’s really depressing!). January is usually deadly freezing where I live. For example it takes forever just to get dressed in the morning: since I ride my bicycle all year around, I need lots of layers of clothing. Hey there blog-reader! Insert your own interpretation here. Despite all this, January can also offer ice skating (depending on the amount of snow and the temperatures) and that is a fun way to stay fit! Last year many people joined the challenge, but not all of them managed to finish – kind of like going to the gym in January: it’s always packed with people, but after the summer you have the gym to yourself. It doesn’t really matter if you can make it through the whole year or not, because it’s not a competition and you probably wont get a diploma. Please remember that the tagging ( #MonthlyPhotoChallenge, #TheChangingSeasons) is very handy if you run your blog on WordPress (Create a list and follow tags in the wordpress reader). This entry was posted in Cityscape, Low-light photography, Photoshop, Vehicles, Winter and tagged #MonthlyPhotoChallenge, #TheChangingSeasons, bikes, Bjørvika, cold, composite images, death, Ekebergåsen, January 2016, Oslo, pollution, snow, The Changing Seasons, winter. Bookmark the permalink. The photos are absolutely stunning. The bikes are so surreal, and the skull is beautifully done – and profound. I’ll be joining you with my photos later! Woohoo! Thanks for this uplifting comment Mara. Love the bikes! My favourite is the monochrome trio. Love your composite too. The monochrome trio is my favorite too. Thank you Mrs/Ms Sampson! You’re welcome, and it’s Miss/Ms. 🙂 BTW My desktop is (uncharacteristically) cluttered with images I’m saving/narrowing down for the The Changing Seasons. I’ll be posting soon(ish). I want to get a few more photos first. Pretty much all the photos I have now are in my yard. My only day off each week is Sunday, and it has stormed every Sunday this month. I’m going to have to sneak away from work to get more variety. There’s nothing to think about: just get out there and take some photos. Hehe. Great start to 2016! I especially like the B&W photo of the three bikes. I can’t believe you actually ride your bike in this winter weather! We are supposed to get a BIG snow on Friday and I am starting to stress about it! I bought extra candles and batteries today. I’ll be getting a post (or two) up soon. Stay warm! I wouldn’t know the first thing about snowmobiles! I do like to have extra batteries for my radio and flashlights if the power goes out! Keeping my fingers crossed that it won’t. I love those bicycles! Your last photo is so interesting- I like it! And here’s my entry. Love those bicycles. They look like an exercise in perfect design. Those bikes are fun for kids and photographers, plus they’re practical for bike riders. My own entry to follow at the weekend. Thanks for the interpretation and comment. Those binoculars never work. They’re totally useless, but look cool when they’re frozen. Looking forward to see your post this weekend. Wow! Amazing images, CG. Love the skull especially. So artistic and fascinating. yes, I can imagine how those bikes ‘provide an easy escape’ – this time, chained in snow, it’s a completely new view. b&w is my favourite version. I like your take on V2. so artistic and well executed. Thanks a lot Klara. I’m glad to see that you’re joining in this year as well. I’ll look at your post (and the other ones too) later. Thanks Andy and thanks for your excellent entry too. Looking forward to seeing more and thank you. Thanks for joining the challenge Tish. Thank you for hosting it, Cardinal. It’s a very interesting challenge. Great interpretation – spot on! You discovered it in the right time. 🙂 Thanks for joining. I’ll look at your post later (later today probably). I’m at work now. The bikes are bike racks to lock your bike in. I go to the gym to keep myself warm. 😀 Hehe. Thanks for the photo/haiku combo tildy1. Cardinal, I am an overachiever this month and just made a version 1 post to take advantage of our snowfall this weekend! Nice shots and I love the area that you’ve chosen Reb. It’s good because I go there almost every day. I love your post and strange is good – that’s exactly why I came up with the new rules. I see that my computer issues are still plaguing me as my comments on your photos are nowhere to be found. Grrrr. Every photo you’ve ever posted with those bicycles always intrigues me. I don’t know why … there’s just something about them. This is the first time however I’ve noticed that they have different coloured lights. I’m looking forward to year 2 of this photo challenge. Thanks for hosting it. No, they’re nowhere to be found. I checked the spam folder too, just in case, but nothing there. 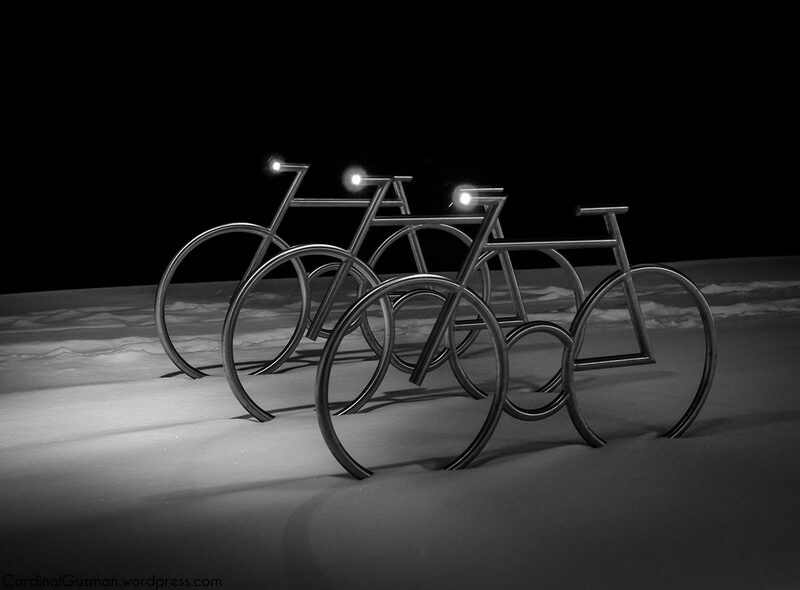 Yeah, the bikes are cool, especially with the lights reflecting in the snow. I was lucky to capture the shots before the snow melted. The ground in that area is heated, so the snow melts quickly there. It’s a total waste of energy. I’m looking forward to see your posts this year too Joanne. I’ve been having some issues with stuff disappearing unexpectedly. Thank you very much for joining from your “mild winter area” Debbie! LOVE the bikes, especially the monochrome trio. Finally got my stuff posted. Going to be a challenging year for me! It’s awesome that you’ve chosen to go for city photography this year Cecilia. Thanks, CG. Having mixed feelings about it right now because it is far outside my comfort zone. I appreciate your constructive criticism and hopefully by the end of the year I will not only be more comfortable with city photography but will have also gained a modicum of competency with it. Onward . . .
I’m looking forward to joining in your V2 this year. Because of travel and also my area hardly changes from month to month I couldn’t commit to your challenge last year. But change is happening and I plan to be more stationary this year so the V2 I am looking forward to. One question, do you only want one photo to interpret our vision of our area? I went out yesterday and have a bunch of images to choose from. You can always combine the two versions if you want to (like I’ve done in this post). Then you don’t have to worry about choosing one photo. Thanks for the great feedback Jo. (P.S. in V2 you only have to post one photo every month). After I’d finished typing that did occur to me, Cardinal, and I thought that one of my ‘snowku’ photos used on Jude’s winter gardens would have been the very thing! 🙂 Too late! Wow! Terrific post CG! The skull picture is fantastic. Hmm, it’s 27 Jan today. If I can get some shots before the end of the month, I’ll join this challenge. My post V2 will come out this Saturday though I will be away, but I will open comments for this time. I love the artistic feel of your bikes and the genius idea of your V2. I used your post to vent out a bit; after all this has been a groundbreaking month for me. Talk soon, Max. Looking forward to see you post Paula and I’m glad you can vent out! Your v2 is stunning! I love that. I used to ride my bike to work year round and when I did, I lived in the mountains (with snow and ice). There were some mornings it felt like the skin on the front of my legs was getting grated off – and that was underneath several insulating layers! Stay warm. As always, love the photos! I like the twist on the challenge this year too. Thanks Michelle. I was going to ask you if you’d participate this year, but then I looked up your blog and found your fantastic action entry! I don’t know why the pingback hasn’t showed up, but I added a link to your post now. Hmmm. I am pingback challenged it seems. I wonder what I am doing wrong? Yes, I can’t miss your challenge! It is one of my favorites:) My bruises and welts are just starting to fade too. So this was an entry that had some staying power too! They are very decorative bike racks. Thanks for the comment and your entry! The bikes and lighting really are stunning. Great captures and love the patterns of the bikes too. All photos are wonderful. Really like your tones. 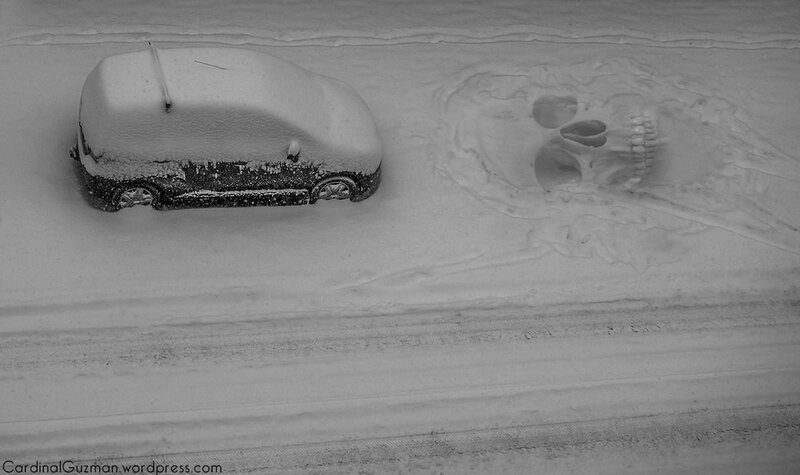 The skull in the snow is brilliant. It’s very creative! Thanks for hosting again this year. Glad I can join in this time!! Love the bikes and the city in wintertime. Thanks for starting this challenge. I look forward to participating this year! Great photos…I have seen other photos of the bikes on Instagram…they must be quite popular!! Great capture of the lady on the train. I finally managed to get my post for January up…all photos taken Jan 30th. Next month i will try to be on time! I’ve also posted some photos of the bikes on IG (and here in the blog earlier). They’re popular among photographers: the whole Barcode area is and there’s lots of interesting angles and views to picture there.